A few weeks ago my fellow blogger and Blogging Angel, Rebecca Levey from Beccarama.com, took me to see A Little Night Music on Broadway. Catherine Zeta Jones starred in the cast of this revival when it opened. And after seeing her inexplicably Tony winning, bird-trapped-in-a-plastic-bag body language performance of Send in the Clowns on the Tony broadcast, I decided to wait until the new cast – headed by the inimitable Bernadette Peters – took over. Ah. The innocence of youth. Now, as a forty something it takes on new resonance. And Peter’s does it justice, seeming to age on the stage, when she realizes her youthful love was too long ago to salvage. Watch her perform and witness a Broadway legend seal her place in history. Luckily, Peters is sitting just about center stage when she sings the song, otherwise, I may not have seen her at all, since the woman in front of me clearly stopped at the store and bought a Bozo the Clown wig to wear to the theatre that night. This was not just a head of hair in front of me. It was a triangulated, bright red, dense mass of curly hair hitherto unseen except in the nether regions of Ronald McDonald’s long lost sister. Had the woman never seen a ponytail holder? Beccarama and I moved seats during intermission, only to find ourselves behind a woman who must have been about six feet tall, and had her hair piled high on top of her head. This was passive aggressive theatre going at it’s peak. If you’re just tall, it’s one thing. No one likes to see Yao Ming scooting his way into the row directly in front of them, but it’s not like there’s a whole lot he can do about being circus-freak tall. But if it’s just your ginormous hairdo, here’s a tip: TONE IT DOWN. Tickets aren’t cheap (although, full disclosure: Beccarama received the tickets from the show’s PR department. I received my ticket because her sister got an ill-timed (for her) stomach bug.) You and your Hairdini aren’t the only ones who want to see what they paid for. Plus, it’s just RUDE. Don’t think for a minute that anyone thinks you’re oblivious: we know just what you passive aggressive hair bullies are up to. And it’s got to stop. 3. If you must smoke, give yourself at least a few moments to air out before you take your seat. Nothing spoils the illusion of being in the African Jungle, or the royal court like the stench of old cigarette smoke. 4. If you sleep, do not snore. I know what you’re thinking : how would I know I‘m snoring if I’m asleep? I don’t care. Snoring is disrespectful to the actors and the people around you. Tie a rubber band around your wrist, and if you feel yourself dozing off, give yourself a good hard snap. 5. If you MUST have a tuberculosis attack the second the lights go out, at least cover your mouth. Why does the coughing begin as the curtain goes up? Passive aggressive anyone? 6. No canoodling. Keep your head on top of your own shoulders, not snuggled up against your date’s. You’ll be blocking someone’s view. And making them sick from the cuteness of it all. 7. Finally, a list of the most obvious ones – but clearly, people need to be reminded: no texting, IMing, phoning, browsing the web, filing your nails, flossing your teeth (I saw that once. Disgusting. ), eating your sandwich or making out with your girlfriend because this is your seventh weekiversary. Get a room. Follow my rules for Hair and Hygiene when you go to the theatre, and you, too, can have a wonderful time. Just don’t sit in front of me. Wow! 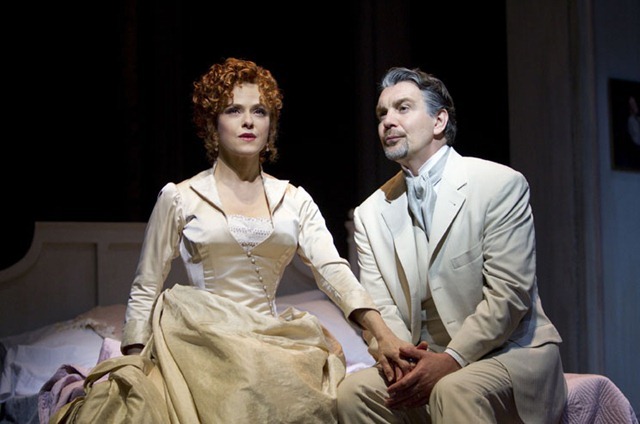 I saw a Broadway show once- Phantom of the Opera- the original cast. It was awesome…and expensive. Had I had to deal with hair or height issues that kept me from seeing the stage… Hair-y Kari would have ensued. I TOTALLY know what you mean about the language. I mean, like, totally. ;)!! Thanks for commenting. You’re my most loyal reader!! broadway shows r awesome right!!!!!! have u seen the river dance! its good but loud! Additionally, you should nix the heavy perfumes as many people are quite allergic to them. There’s nothing more horrible than being perfectly healthy when you arrive at the theatre to only suffer a near death experience asthma attack (which of course will annoy your own neighbors) because some person in the row in front of you felt it necessary to douse themselves in eau de cologne. Can’t believe I forgot that one!!! Esp. since my husband is super allergic. Thanks for reminding me of yet another inconsiderate thing people do at the theatre! How true comments!! I am not a Broadway show watcher, heck never even saw one to compare your experience with anything related to mine, however all your suggestions are plain simple polite gestures that one can make to your surrounding viewers without ruining their viewing experience or wasting their money on something that costly without actually the fault of actors. I totally sympathize with you and arrogant people do all these sort of things in the name of fashion but little they know its more on savagely side. sir,for ur information would u spend money on stuff ur daughter was in or who ever. u have a problem. it was probly important to them. Good for you! I have actually said to people “This is not your living room!” Some day, I’m sure I’ll pay. But it sure feels good saying it. Haha! I will have to watch out for #6 … and I hope nobody feels the way you do about it;) Not that we go to the theatre all that often in South Dakota, but I do rest my head on my husband’s shoulder at the movies. Oops. The thought of someone flossing in a theatre is enough to make me gag. Who does that? Anyway, great post. Loved it. Congrats on FP! somebody was BRUSHING their THEETH. At a symphony. WOW! I just read your theater experience and, I must say, I laughed out loud. It was just the lift I needed this morning. Being under tall myself, I have a lifetime of “Mr. Big Head” experiences. I have learned I often have a better musical theater experience sitting alone, in my living room, listening to the music, imagining the actors. I have my own theater hell experience – during the intermission during the musical Oliver, I was standing up in front of my seat, when the woman sitting behind me threw up all over my jacket and, needless to say, my seat. Without one word of apology or “Let me clean that up.”or “Let me pay for the dry cleaning.” she and her companions left the theater leaving me and my fellow seat mates dumbfounded. So gross. So sorry. And I do believe that trumps Bozo head— big time! Great Post with many great tips. Wouldn’t life be so much easier if we tried to stay out of everyone’s way? I recently saw Phantom Of the Opera in Cleveland, and the people behind me would NOT stop chatting. It was so rude. We had great seats, but thanks to the people behind me (one of which was obviously eating something wrapped in celephane) I could barely enjoy it. They kept talking about what they thought was gonna happen next. It was all I could manage not to shout at them during intermission. This is a great list. If I ever do get to see a show on Broadway, I hope I don’t encounter any Bozos. These rules should be printed (with your permission of course) and put on the doors of all theaters. I really hate being in the proximity of smelly people at the best of times, but when I’ve PAID to be there it’s even worse. As for the hight issue, at 5’4” I’ve just learnt to deal with it sadly. Oh and I wonder if those silly cuples realise it’s more romantic to just hold hands and then you can actually see what’s happening yourselves! On another note this also should apply to cinemas, you don’t have to worry about the actors but you’re still sharing a space. Thanks for the tips! I’ll be going to NYC at the end of September and I plan on going to a show — I don’t know which show yet but with Bernadette in this one I might have to go to it! Did you see her in “Into the Woods?” It was insanely brilliant –of course. @Fara, so agree with you about the cinema application. As a former movie reviewer, I cannot tell you the things I saw people do in the theater. The first and formost was bringing an eight year old for a scary movie. If you are over the age of 30, it is time to start acting like an adult, no matter what venue you are sitting in. The best revenge for these annoying people is first row mezzanine! 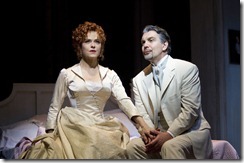 Much as I love your advice, I’m just jealous you saw the ageless Bernadette Peters! And Elaine Stritch. Don’t forget her! She was awesome! I am so laughing. Luckily, I have never had experiences like that at live performances. But I have had a couple like that in movie theaters. A friend had her date literally rearrange everyone, so that he and she could sit next to each other. That included a woman with a walker. My friend was mortified. I love this! I love going to the theater, but it seems like people lose their common sense as soon as they take their seats. I especially agree with the coughing thing. It’s like they wait for a monologue or your favorite song to hack up a lung. First- I am insanely jealous you got to see Ms. Peters because she is one of my idols. Second- I would like to add flashing buttons/shoes/hair accessories. The last time I was at the theatre a girl was celebrating her bachelorette party and had a flashing tiara she wore throughout the show. Never in my life have I wished for a bride to have some sort of hair disaster or zit explosion on her wedding day- but that day I did. Rude. Your comment totally cracked me up. I once went to a show – a serious play – and someone in the audience wore a Ventian mask the entire time. Annoying….and weird. You forgot one tip: no farting. I was at John Williams concert at the Hollywood Bowl and some guy let fly in the middle of the cello solo in “Schindler’s List.” And let’s just say the Bowl amplifies all sound. Your tips are right on target. Eeee, flossing? Flossing should not be done in front of ANY other person, including one’s spouse, in my opinion. Bleah. Another thing to consider when attending any event where people are crowded into a small space – be careful not to eat something before the concert that will give you gas. (Or take some Beano or Gas-X along with you.) We went to the Bjorn Again show (ABBA cover band – very fun show – recommend! ), at which we were encouraged to get up and dance and sing along. Someone in front of us was making terrible stinkies through the whole concert. Didn’t he realize we couldn’t escape? Eeeewww. He should have excused himself and retired to the restroom. The Fox Theater in Atlanta has an amazing and witty list of etiquette rules for attending a show that they print in every program. I laugh over it every time I see a show there because it’s so funny, but so true. The one I always remember is “Don’t jangle the bangles,” i.e. keep the loud jewelry at home. A link to this post should be printed on every ticket sold across the US and Canada for every event. I hear you loud and clear and I’ve been there a million times. Snoring is a big one… particularly from men who have been dragged to the ballet by their wives and have ABSOLUTELY no interest in being there. Ladies… how about leaving the lug at home! At the Streisand show, the gal next to me was sending text messages to someone else in the audience. After the intermission, I told her that if she even opened her phone, I was going to fling it across the hall! She gave me a dirty look but kept the device closed. I love seeing Broadway shows. I’m going to print out your blog and pass it out to people sitting around me next time I go. Did you see the video from awhile ago when Hugh Jackman stopped the performance to tell someone to turn off their phone? 1. The child behind you who continually kicks your seat. 2. The candy wrapper rustler. . . throughout the entire second act. (I experienced this three days ago at Promises, Promises). 3. The head mover. Everytime he/she shifts position and moves his/her head left of right, I have to shift my position so that I can see. Sit still!!! (Maybe this one bothers me a lot because I’m on the petite side). Thank. You. I saw August Osage County seated in front of a man who had apparently seen the show several times before, and thought that the actors needed his help in remembering their lines. He recited his favorites along with them, and offered his running commentary. I turned around during intermission and reminded him that saying lines with characters is acceptable, though still annoying, when watching The Big Lebowski in your basement. Not at live theater. Great post — both funny and true. One time I was at Lincoln Center and this older couple came and sat by me. The lady was so drunk she passed out on me. No amount of elbow jabbing could dislodge her and her husband totally ignored it. Another reminder for those who like to douse themselves in DDT, otherwise known as “perfume”. Many people are allergic, or even just sensitive to the stuff, and in the claustrophobic atmosphere of a theater someone with the mildest sensitivity can become sick, with sore throat, burning eyes, and even itchy skin. Perfume today is not made of flowers, unless it’s really really expensive; it’s a concoction of deadly chemicals nobody should be putting on their bodies anyhow. LMAO….excellent observatioons…and the same goes for movies!!!! Catherine Zeta-Jones…emoting? Let me know when that happens…. There’s a line that I often trip over myself, but you managed to walk it quite smartly – that line between saying nothing in interest of letting others hang by their own rope, or retorting and having it escalate into ugly comment warfare. I heard of a horror story once where this really amazing opera house started getting threats from this mysterious guy saying that bad stuff would happen if this young starlet didn’t get the big roles. Turns out the guy writing the letters was some anti-social bi-polar paranoid schizophrenic with a face injury and probably some PTSD. So who can blame him? Everyone has their problems and even phantomy ghouls can fall in love. I once fell in love with Broadway. I had all the hopes and dreams of any young girl with star filled eyes and a newly received breast augmentation. I sang into my hair straightener while looking in the mirror. I did this nightly until burning my upper lip severely, necessitating a skin graft from my now bulbous and pert bosom. Live theater is for the birds if it is outdoor and I would never settle for doing Shakespeare in the park. It is below me. I’m fine with doing an updated version of Macbeth where it is set in Detroit and adapted to be about the fall of the auto industry but it had better be in a musty black box near the garment district! I need a theater near a dark watering hole where I can hide myself in gauzy chiffon and breezy linen. There, I will end my nights in mornings and chisel away at my fragile youth in drams of gin and solitude. Ah! The play’s the thing. I don’t know who you are. But I think I’m in love. Excellent comment. EEEEEEEEEwwwwwwwwww, EEEEwwww, just thinking of some of the things you mentioned is making me gag!! I hate body smells! Yuck! You covered a bunch of good gripes! Sounds like a good reason to stay home in my safe house, with my nice husband! I’ll watch stuff at home, Thank You Very Much! I’m Not a big fan of Broadway anyway!! Matthew Morrison in Hairspray??? So yummy! OMG I love Broadway and have for years. My girls and I trip up to NYC every couple of months for sushi and a show. But I have to say that the people are part of the fun and spectacle for us work-a-holic ho-hum- Baltomorons. We laugh too loud and too long. We try not to sing a long but sometimes we do. We wave, we cheer, we cry. We didn’t even know you noticed us. Let me be clear: New York LOVES enthusiastic audiences who laugh and cheer (but, ok, maybe not sing along). Broadway DEPENDS on tourists like you to come to the theatre. Keep on coming, and waving and laughing loudly and for as long as you want. We do notice you. And we’re glad you keep on coming! Excellent post! How many times have I paid a fortune to go and see a show only to find I’m sitting next to a frustrated singer (as they sing along with the entire score!) behind an incessant fidget or in front of someone who clearly can’t stop talking for more than 10 seconds at a time?! Lots! Tall people are always annoying (people over 6 foot should sit in the back row I reckon!) but never had the big hair yet! One day…..!! Loved the post, but really felt the need to say DITTO to the above comments regarding perfume. Congrats on getting a spot on Freshly Pressed. Perfect post. Last week I took my son to his first musical – London West End. I was that person telling the group beside us to be quiet (in my defence I was not the only one who told them!) A group of Russian teenagers who chatted, loudly, through much of Oliver, one who wouldn’t turn off her mobile with a bright backlight etc. etc. It is hard to convince your six year old to whisper, and even then only do it occasionally, when everyone around him is making noise. As you say – this is not your lounge room people. Surely after paying all this money for tickets they realise the difference? At least other people were also telling them to be quiet. I can’t tell you how many times I’ve been the only one — taken abuse for it – and then been heartily thanked by others who express their outrage after the fact. Great! Where were they when I needed them? Fair comments – I think we have all suffered from similar things which can ruin a night out! brilliant post, had me chuckling at my desk! Love the post. Sadly, all this is true about UK theatre too – I saw a touring production of Spamalot a couple of weeks ago, and the guy next to me arrived with a couple of minutes to spare and then proceeded to eat his picnic lunch during the opening number! I go to the theatre (somewhat) often (I was just there last night actually) and I have to say I very, very much agree with everything you’ve said. Might I also add that I think many, many people have lost what seems to be any actual respect for the theatre. Granted, not everyone enjoys, or can afford, to dress up to go to the theatre. I understand this. But just last evening, at Phantom of the Opera in London, I saw so several people in hoodies or t-shirts, it made me, honestly, angry. I’m not saying one should look like they stepped out of an Oscar spread, but is a crisp button-down, or blouse, and a pair of dark jeans, or skirt (or something similar) too much to ask? Now, I may sound elitist, but I firmly believe one should at least attempt (as best one can) to show respect to the performers, and to the legacy of live theatre, and actually put some effort not only into their grooming (as you summarised) but further, they should show they respect the show and those working for their enjoyment! Maybe I’m just going to the wrong shows, but I hope everyone out there doesn’t think hoodies and t-shirts have somehow become acceptable at the theatre. Sadly, people don’t even dress for the opera anymore. It feels like the end of an era. Maybe the Mad Men craze will help bring back glam. Really good point. It’s not a question of your own personal comfort, or trying to make a statement against elitism or anything stupid like that. It’s about having respect for other people, and, inevitably, for yourself as well. Brilliant – couldn’t agree with you more! We went to see Diana Krall in concert at Kenwood House (outdoor venue in London) a few weeks ago, and a couple in front of us, totally in our line of sight, canoodled through the entire show! SO annoying – why did they bother buying tickets? And we couldn’t NOT see them, unless we chose not to look at Diana! Oh and one to add is those single wrap cough drops that old people seem to have to unwrap every 5 minutes! You saw someone FLOSS their teeth once before? How the hell does that happen? Oh, excuse me, I feel a bit of vegetable in-between my teeth let me just, ahh… I say ditto on the heavy perfumes too, I can’t stand when someone bathed themselves in something that smells… awful, and I can’t escape it. LOL!!! I live in London and go to the theatre all the time and the same rules apply also on this side of the pond…. :o)…mayb e a leaflet should be distributed at theatre foyers as a public service…lol.